I use Winsor Newton brand professional grade and will have these colors available at discounted bulk rate pricing. Also available at AC Moore and Michaels but be sure to use their coupon as they are very expensive. On line resources are always discounted: Jerrysartarama, DickBlick, and Cheap Joes. Winsor Newton has a student grade , Cotman, that is affordable. Use tubes rather than pans. Using the Split Primary Pallet provides mixing power for the world of colors! Colors are rarely pure and are either a warm hue or a cool hue. - A flat - 1-1.5 "
The one material not to budget buy is paper .Mold made cotton by Arches at 140 pounds is the industry standard and is available by the sheet (least expensive) that can be cut to size. Arches sells by the block but that is the most expensive alternative. Canson is good paper as well. On-line is the best resource. Michaels and AC Moore only sell the blocks. I will have bulk purchased paper available in class. Karen works in several mediums with watercolor being her favorite because of the magical qualities of translucence, and luminosity. ​She is listed as a Gallery Artist at SSAC and a Juried Member at CCAA and also teaches watercolor classes at CCAA. Her gallery/studio 'Studio off Main' is located at The Red Barn in Osterville." "The connection between art and nature has always been inspirational. Painting for me is not documenting, but rather capturing a glimpse, and experience that is is quickly gone. I hope to capture the essence of the subject with reflective nuances that evoke a response, or solicit a memory. I thoroughly enjoy working with students that want to explore watercolor and always look forward to presenting the medium as doable, creative and exciting. 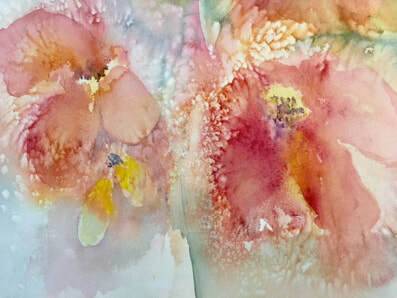 My course introduces the three methods, and various techniques, including the tools and materials associated with watercolor."